Pumpkins, scarecrows, clutches of Indian corn, and rainbow showers of leaves fill our days and nights as fall reaches its apex. We are surrounded by the joys of the harvest season; a season beautifully reflected in our home schooling journey. As eclectic homeschoolers, I take favorite bits and pieces of different schooling theories and practices, and meld them into the perfect curriculum for my daughter. A literature-based curriculum is one that speaks to us, in theory, practice, and inspiration. Aria and I put our heads together and came up with our favorite fall picture books for toddlers, preschoolers, and even big kids. The following picture books will inspire and teach your students or children about the wonders of fall! One of our favorite authors brings us a wonderfully, artistic vision of autumn. Telling a very simple story, this book’s promise lies entirely in the pictures. Ehlert creates people, animals, and pumpkins from leaves, twigs, and acorns, inspiring a child’s creativity to craft with natural resources. Rebecca Estelle hates pumpkins. Can she ever learn to love them? In this lovely tale, our main character is given an accidental gift of pumpkins. Initially disgusted, her spirit of practicality takes over, and soon she has built a community and an annual tradition around a fruit she once despised. This book speaks to our homesteading hearts, and Aria adores Rebecca Estelle’s journey to the joy of pumpkins. This cheerful book teaches the wonders of all four seasons through the perspective of a young boy and his apple tree. Spring brings blossoms to gather, in summer he builds a tree house, autumn bring him an apple harvest, and in winter he hangs garlands to feed the birds. The journey of the seasons is a happy reminder of what has been, and what will be during the course of a year. This book makes an excellent story for apple picking time! Little mice, Dot and Jabber, are hot on the trail of a mystery! How did a tiny oak tree sprout so far afield from the larger one? In this beautifully illustrated and engaging story, the little mouse detectives discover the answers to their questions, and learn about the lifecycle of the oak tree. Strega Nona and her haphazard helper, Big Anthony, are back in this story about gardening and the harvest. Big Anthony and Bambalona are learning the importance of gardening, and keeping everything orderly and neat. In true Big Anthony style, he fashions himself a garden that grows into a jungle, bringing him a harvest he could never had anticipated! In the spirit of compassion and community, Strega Nona offers the harvest to her fellow villagers, and the village celebrates the bounty of the harvest. The sweet story harkens back to fairytale roots, and encourages a spirit of generosity. In this rollicking story, the little old lady heads into the woods to gather herbs. On her way home, she finds herself followed by some surprising guests! Kids can laugh, clap, and stomp along with the story, engaging little hands and little minds as the little old lady finds a solution to her noisy problem. Two little mice find a pumpkin, and both have big plans for it. As the pumpkin grows, the two mice begin working together, making a fun, fall experience for the entire mouse community. In this visually beautiful book, Ehlert uses watercolor collage and bits of leaves and seeds to tell the story of the life of a sugar maple tree. Ehlert doesn’t just stop at the tree’s story, she also includes information about birds and gardening objects. The back of the book contains a glossary of terms about the science of tree life. A little scarecrow boy wants nothing more than to follow his father into the big fields and scare crows away from the crops. However, his father says he must stay home. The little scarecrow practices making his fiercest faces and eventually finds himself tested by a crow. In the end, he makes his father proud. This fun fall picture book gives kids a reason to make funny faces! More on the historical and scientific side, Corn is Maize explains the origins of corn and the good things that can made from the corn plant. From its history as an agricultural product of the First Nations people to its introduction to the settlers, we learn about the journey of corn and the role it played in early history. 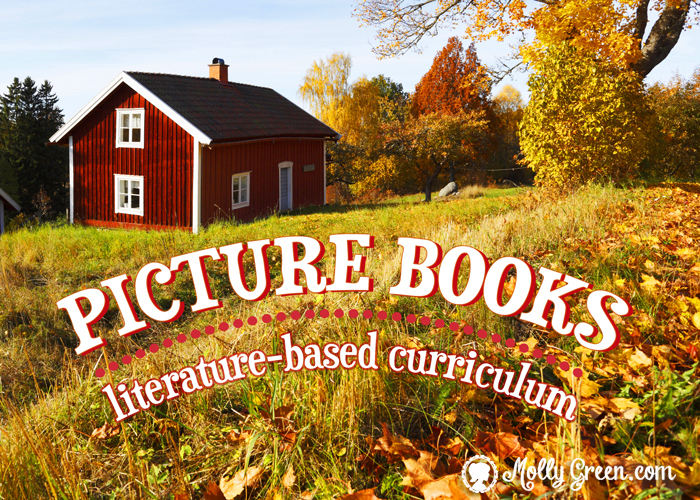 Each of these fall picture books has been the subject of unit studies in our homeschooling. From each one we have been able to extrapolate math fun, science, art, history, and vocabulary and sight words. We explore nature, test recipes, and find inspiration for new adventures. Best yet, from each of these books we are able to soak ourselves in the fall season, even on the rainiest, chilliest days it has to offer. Mimi Mason is a homemaker, homeschooler, and micro homesteader. She chronicles her family’s experiences with sustainable living on her blog, The Simple Survivalist. When she’s not elbow-deep in garden soil and bread dough, she can be found hidden behind the pages of a good book.